The museum building was donated to the town of Wilbur in 1977 for the use of an area museum, honoring the early pioneers of Almira, Creston, and Wilbur. 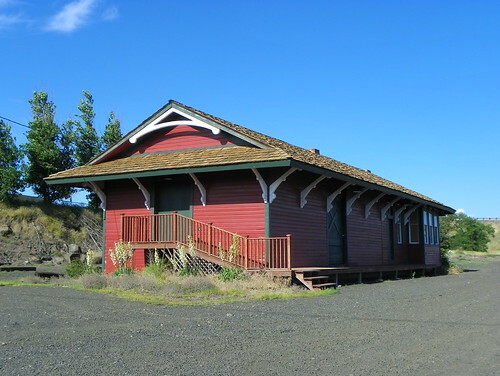 The building and museum are managed by the Big Bend Historical Society, comprised of people from all three towns. The museum includes a “farm annex” with old equipment, cattle brands, cars, wagons, and much, much more. For special showings call: Daryll Bahr – (509)647-5401; Helen Ladwig – (509)-639-2346; or Ron Laughbonn -(509)-647-2746. For family history/genealogy information contact: Daryll Bahr – 647-5401. The museum has much to offer. Come and take some time for a pictorial journey through our colorful history; find your old teammates or distant relatives! Discover newspaper articles from the Wilbur Register preserved on microfilm and ready for you to have printed. Hometown of Wilbur’s celebrated founding father who earned the nickname “Wild Goose Bill”. Tuesday through Saturday 10:00 AM to 4:00 PM. By appointment only the months of October through May. Richly detailed interiors and exhibits tell the story of Lincoln County’s past. The museum’s collection of artifacts is available to researchers. Also available is an American Indian display, a railroad memorabilia display, farm machinery, steam engine, combines, tools, guns, a prison cell, printing press, vintage fire engines and an impressive display dealing with the outlaw, Harry Tracy. Visitors are treated to interesting displays of antiques and a glimpse into the history behind this wonderful land of golden wheat. The large barn addition is similar in style to turn-of-the-century barns found in the Odessa area. There are many restored pieces of farm equipment to be seen inside, as well as some restored automobiles, many photographs of early harvest scenes and many other artifacts used by pioneer settlers. The grounds are open year round. The Visitor Center and Museum are open in the summer and by request during the fall, winter and spring. Please call for exact dates and times. Located in the guardhouse on the grounds of Historic Fort Spokane. The grounds are open year round. Information, boat launch permits, America the Beautiful Senior, Access and Annual Passes (formally Golden Age, Access and Eagle Passports),book sales, exhibits and an interpretive slide show. The Sentinel Interpretive Trail begins near the parking lot.